You're sitting in a multiple deck game, with doubling down after a split (DDAS) allowed. You are dealt a pair of sevens and the dealer is showing a seven. What do you do now, in what would appear to be a tough decision? Asking that is not an invalid question, because you're not exactly hitting the jackpot by being in a situation where you can split sevens. The chances are obviously slimmer that a strong hand can be made with a starting point of 7, as opposed to having eight, nine, or ten as a value. Hitting a hard 14 (7,7) against the dealer's upcard of seven looms as a losing proposition. You're going to get beat about 63% of the time in this situation. 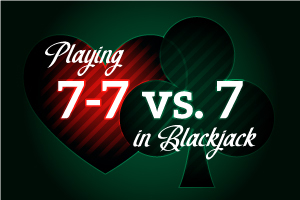 Executing a split of the sevens actually cuts your losses down dramatically (only 45.5%), because of one key element - the fact that you're going to wind up pushing with the dealer on 17% of your hands. When you can win more and lose less than the alternative, you're facing a play which is a no-brainer. So go ahead and split the sevens.